With environmentalism, we talk a lot about footprints: carbon footprint, plastic footprint. water footprint. It all relates to usage... and usually it's too much. Art always has a way of making the story tell so much more, and helps us visualize the reality of a situation. 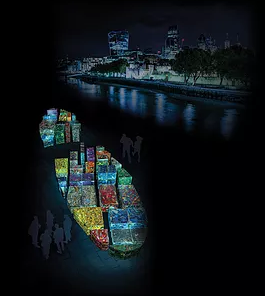 Such is true with the Thames Plastic Project Installation, Future Dust. 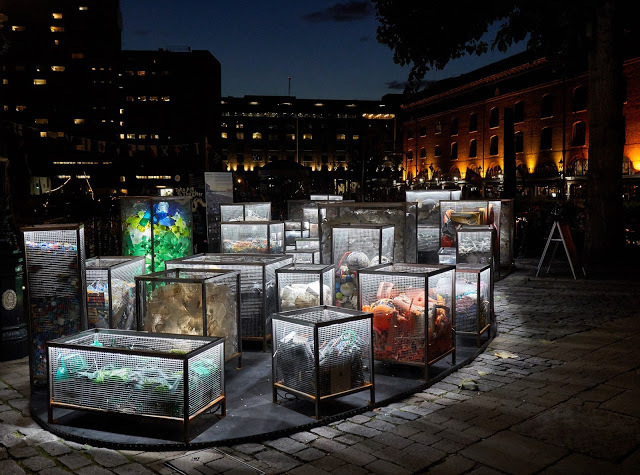 "Her latest line of work utilises discarded plastic objects collected from various locations in the Thames. Her sculptures with these plastics are virtual ‘Time capsules’ preserved and displayed as visual evidence of the long-term properties of these polymers." The project started 2 years ago in September of 2016 to help clean the tidal area of London's Thames River of plastic marine debris. In addition to cleaning (by way of handpicking the trash along the shoreline), the materials were color-sorted and became the building materials for the installation. Along the way, the scientific information about how plastics photodegrade in the sun (as well as the overall environmental impact of marine debris) is highlighted to all patrons. 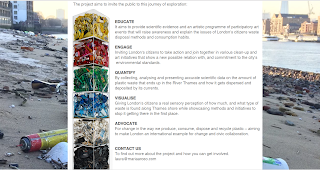 For more on the Thames Project's research on plastics, click here. Check out the Thames Plastic Project website to learn more. Be sure to check out their gallery to get a full view of the project. Photo of Maria Arceo from http://www.mariajosearceo.com/maria-jose-arceo-biography/; Images from https://www.thamesplastic.com/ (including the screenshot from their website of their goals), and https://captainjpslog.blogspot.com/2017/09/totally-thames-installation-future-dust.html.